DO NOT underestimate the power a father has in a child’s life. The role of the father has change dramatically since even a generation ago. My father was still relegated to waiting room while my mother labored and gave birth. My dad even had to be woken up by the nurses after one of my sibling’s births. Today, the father is often an integral role in the entire birthing process. Many fathers will enroll in child birthing classes, being the mother’s coach, as well as childcare classes wherein the father learns (perhaps for the very first time) how to change a diaper, bathe a baby and the like. Becoming a father can be one of the most significant events in a life of a man. For many fathers, the birth of a child can be a significant emotional experience filled with mixed feelings such as excitement, fear, maybe terror is a better word, and of course, joy, satisfaction, anticipation. These responses often depend on whether the pregnancy is planned or unplanned, the quality of the relationship with the mother, previous experiences with childbearing and childrearing, and other cultural and ethnic norms. The fathers often brings to the childbirth experience his presence, knowledge, and understanding of the laboring woman; love for the mother and his child; and a sense of advocacy coupled with a desire for the woman to have a positive birth experience. However, many men feel ambivalence about being there. Since the father is more of a spectator than a participant in the process, he is more likely to witness the actual birth process, for example, the “water” breaking, vaginal delivery, the blood and placenta, cutting the umbilical cord etc. While most fathers are excited about the process and can view only what they desire, some may not be so excited. This may be a good talk to have with you significant other and discuss the possibility of NOT having the father in the room. Fathers sometimes find their sons’ infancy challenging. They love the baby and delight in his noises and new activities, but infant care seems to be more Mom’s area. In fact some mothers sometimes unwittingly prevent Dad from taking a more active role by insisting that the baby be held, fed, and rocked in a particular way (usually hers). Dads may then fall back on working and providing for their new family instead of taking an active role. Yet studies have shown that infants whose fathers were closely involved with their care were found to be more cognitively developed at one year of age than infants with less involved fathers. In addition, fathers’ positive attitudes toward their infants were related to their children’s problem solving competence later in their children’s lives. Don’t shoot the messenger but studies have even shown that while the mother’s role was important, by far the most influential factor in a child’s emotional health was how involved the father was in a child’s early life. When fathers spend more time with their babies, they get to know exactly what each of their baby’s signals mean. This familiarity allows fathers to respond sensitively, meaning that they know when their baby is hungry rather than when he just wants a change of scenery. Fathers tend to provide more verbal and physical stimulation, by patting their babies gently and communicating to them with sharp bursts of sound. As babies grow older, many come to prefer playing with their fathers who provide unpredictable, stimulating, and exciting interaction. This stimulation is important because it fosters healthy development of the baby’s brain and can have lasting effects on children’s social, emotional, and intellectual development. Interestingly, as a child grows, an involved father will typically spend more time playing with the child. Often this play is the rough-and-tumble kind which most kids thoroughly enjoy. Yet, even if a father is NOT as involved, the father becomes extremely important to the child through playing. When fathers play with their toddlers, they are not just entertaining them. They are providing challenges for toddlers to learn how to interact with the world and with others, in a safe, structured way. Through rough-and-tumble play, fathers create obstacles for their children and teach them about limits and boundaries. At the same time, they encourage them to explore their own strength, their ability to do new things, and their impact on the world around them. Toddlers who must work out for themselves how to achieve goals…such as finding a ball the father has hidden behind his back or wrestling their father to the ground…are practicing important problem-solving skills. In fact, when fathers are good at playing with their young children, these children score higher on tests of thinking and problem-solving skills. This play flows over into the emotional realm as well. Such play can teach kids frustration tolerance, dealing with loss or defeat, being good sports, and the like, but mostly helps the child explore and experience their emotions and express them in appropriate ways. When children have fathers who are emotionally involved-that is, they acknowledge their children’s emotions and help them deal with bad emotions-they score higher on tests of ‘emotional intelligence’. Moreover, they tend to have better relationships with other children and behave less aggressively. Fathers’ involvement in their young children’s care can even last well into adulthood. Again, don’t shoot the messenger, but mothers seem to have much less impact in this area of emotional regulation and peer relationships than fathers. It really is fathers who can have a major influence on helping their children build strong social relationships during childhood and later in life. As far as gender differences, a boy learns from his father, without even realizing he’s doing it, what a man is and does. He learns about masculinity, about what men like and don’t like. He also learns from the father how to interact with women, based upon the interactions he sees between his father and his mother. Your leadership in the family (even in divorced or non-married situations) is essential to your son. Many adult men report that they either wanted to be “just like my dad”-or wanted to be his exact opposite. Girls also learn how to let men treat them based upon their parent’s relationship. Studies have shown that women who grow up with parents who are abusive toward each other will often find themselves in abusive relationships. The role of the father in this area is critical. What girls want most from their father’s is TIME. You don’t have to do special outings or make every moment ideal, just doing chores with her, being around her. Ask her to help you rake the leaves, wash the car. If she wants to go to the mall with her friends, either go with her and make it an outing (seriously, she may roll her eyes at the suggestion, but later in life she will appreciate your time) or insist she stay home and help you around the house. Of course, you are still at the beginning of your journey with you child. The bottom line is that the father is VITAL, ESSENTIAL and CRITICAL to the child. Fathers are as involved as you can and be aware that little eyes are watching you to see how you behave. They desire your TIME and presence. Realize that just being there, hanging out with them is the greatest gift you can ever give them. Mothers, unless the father is abusive to the child involve the father as much as possible in every aspect. 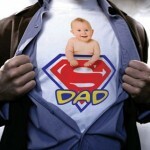 « Let Dad Fly Free!